This is a historical resource! This page belonged to a former pack and is now defunct, but it is being kept for posterity and future reference. Please contact the former pack leader(s) prior to editing or deleting this page. Krokar was originally founded by Lucille and August Cormier on July 10th, 2014. The group formed when a pair of dog mixes came across coydogs and wolfdogs while looking to trade. They banded together due to their shared fishing heritage, teaching each other new techniques and skills to strengthen their combined knowledge. Krokaran culture revolved heavily around a lifestyle that thrived through fishing, animal husbandry, and trading. The pack society was sociocratic in nature, meaning that the well-being of Krokar was governed by a trusted council under the Captain, who discussed and reasoned together until a final decision was found. On October 31st, 2018, Krokar was disbanded following an act of arson that left its home destroyed, its animals scattered, and its people leaderless. Some of the Krokaran have known each other for quite a while. Several members were descended from dogs that belonged to fishermen while others learned to fish by trying different techniques they saw in scavenged books. The group formed when a pair of dog mixes, Aster and Briar came across coydogs Claude and Pepper, and wolfdogs Gavin and Taseko while looking to trade. They banded together due to their shared fishing heritage, teaching each other new techniques and skills to strengthen their combined knowledge. Eventually, Aster and Briar had a litter of four puppies: Tybalt, Finlay, Gus, and Eliza, increasing their numbers. They, along with the rest of the group's members, passed down their shared knowledge of fishing, trading, and animal husbandry. All pitched in to help the group survive and groom the next generation of Krokar, gaining the huntress Iroquois in the Summertime. In October 2012, Aster, Briar, and Tybalt were away on a trading trip when the hurricane struck. Tybalt survived while his parents did not. Gus was away as well, exploring a new shoreline when he came across Lucille, whose ship also fell victim to the hurricane. The two eventually made their way back to Gus's family, only to learn of the death of his parents. Despite the loss of two of its members, the group had to move forward, gaining Hazel as a member, and she quickly found her place with the livestock and Gavin's caribou. They continued trading and fishing until 2014 when their rivers flooded, driving them from their homes and forcing them to resettle elsewhere. Having traveled through the area, Gus and Lucille knew a good spot and the group decided to move there while looking to bolster their numbers. Some have moved already while others are still working on salvaging their old homes to bring those supplies to their new home. 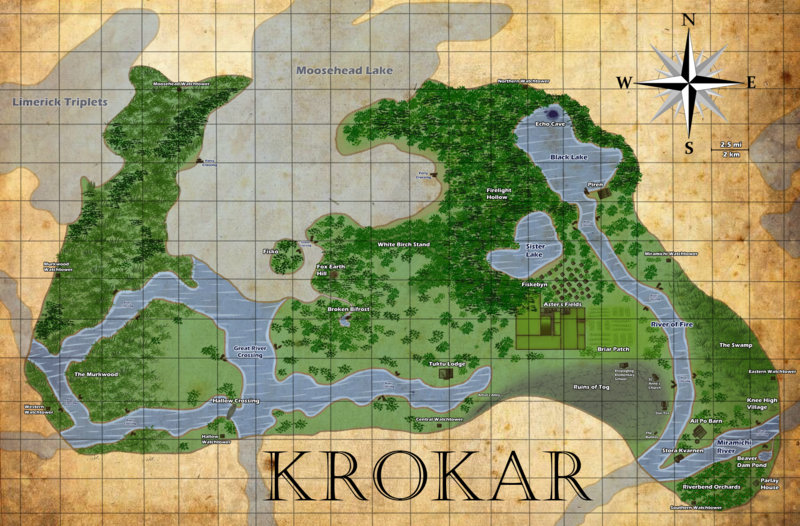 And, from there, Krokar began to grow. The pack enjoyed four years of success, expansion, and relative tranquility until an act of arson by a group of loners left its home destroyed, its animals scattered, and its people leaderless. Krokar disbanded on October 31st, 2018. See our History page for more information. Played Characters: Eliza Cormier, Oscar Morelli, Aenan Pyr, Ascher Stormbringer, Bramble Parhelion, Derek Winter, Eros Damaichu, Ibycus, Inara Ailurus, Norah Morelli, Twist Dogvane, Walker Dupree, Percival Parhelion. NPCed Characters: Finlay Cormier, Logan Cormier, Hazel, Ilse Verhoeven, Jonah Leomaris, Marla de la Croix, Salome de la Croix, Alex Winter, Keabetswe, Tarina Skadi, Remy Cormier, Reluceo Vela, Cora Cormier, Daisy Parhelion, Taufir Stormbringer. Former Leaders: Lucille, August Cormier. Former Members: See the Krokar category. Deceased Members: Sorcha Logan, Nikolas McCreery, Lilith Fairbreeze, Chetan, Ilse Verhoeven, Alex Winter. Off-board: See Old Ironsides Trade Depot for a listing of former members residing in Portland. 2014: Aphrodite Donovan, Adonis Donovan, Gregory Pendragon. 2015: Iona, Tomas, Mairead, Willow Cormier. 2016: Lotan, Tiamat, Nellie Cormier, Norah Morelli, Oscar Morelli, Remy Cormier, Logan Cormier, Bramble Parhelion. 2017: Sabrael Vela, Genevieve Auditore, Elle Cormier, Fionnlagh Cormier, Calrian, Malik, Yuka Soulbringer, Tintri Soulbringer. 2018: Daisy Parhelion, Percival Parhelion, Cora Cormier, Taufir Stormbringer. Played Characters: Lucille, August Cormier, Aindrea Donovan, Gunslinger Russo, Zelda Arreopath, Octavius Poer de Angelo, Artemis Nightclaw, Piper Dae, Gaius Faustus, Mariana Rojas, Marina del Rey, Theon Russo. NPCed Characters: Pepper, Claude, Finlay Cormier, Iroquois, Hazel, Taseko, Gavin. The basic culture in Krokar was based around fishing, trade, and animal husbandry. Everyone was expected to pitch in in some manner. If a member was afraid of water, that was okay because there were tasks with trade and the animals that didn't require even getting in a canoe, except possibly for a quick trip across a river. Many members believed in a form of animism, where all creatures and resources deserve respect. There were varying degrees of belief, from basic superstition to belief in a water goddess. Other religions that didn't involve animal sacrifices were welcome, as were no beliefs at all. Krokar was Luperci dominant, and accepted all species. Non-shifters were also welcome, although they might have been somewhat limited, only because hands were required for many jobs like building, tailoring, etc. This spring festival celebrated a new year of trading and traveling was about to begin. Springtime marked the period of good fortune and luck to be brought to the pack once again. The summer, being the nicest part of the year, was the time for some caribou races and the annual "Sink or Swim" contest where every Krokaran was invited to test their skills at building a water-worthy vessel from scratch specifically for this event. In the fall, after the crops were harvested for the year, thanks was given to the gods for those who believe, and everyone else simply celebrates another good season. A celebration to keep things alive during colder months, which included ice fishing, feasting, bonfires, and general merrymaking. When two Krokarans chose to marry, a mateship ceremony was performed. This ceremony could be as simple or as boisterous as the two individuals pleased, but always involved the binding of their hands together with rope to form a symbolic knot. Krokar's coming of age ceremony, wherein Guppies of 8+ months of age had to go fishing and make a catch. 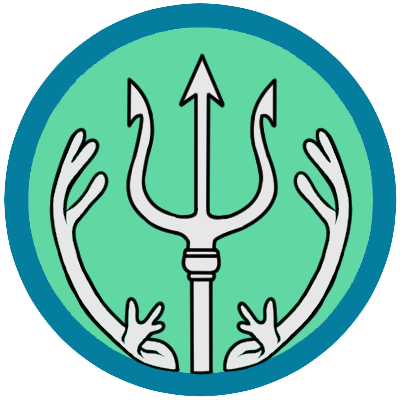 The first fish they reeled in became their emblem and marked their passage out of their childhood rank and into the adult ranks as a Greenhorn. Krokaran packlands encompassed the northeast side of the River of Fire area and the eastern loop of Saint John's Chokehold. Their territory was home to several tributaries, an island, and two lakes, which were the main landmarks. Surrounding the lakes is dense forest that stretches north and west. On the sandy shore of the southern lake was Fiskebyn, the Krokar village, and Aster's Fields, which housed a stable and a barn with a chicken coop. It also served as grazing for the livestock. Old remnants of human activity are slowly being reclaimed by the land, but the city of Elsipogtog, known in Krokar as the Ruins of Tog, still exists in the form of crumbling buildings. Surrounding the Ruins of Tog is what used to be farmland, which is now also overgrown and starting to be reclaimed by the forest. The Miramichi Wilderness made up the eastern part of the territory, which consists of forests and fields, while The Murkwood flanked their territory to the west. See the Territory page for more information. Fiskö: A small island located on Moosehead Lake just off the shore of Krokar's northwest territory. White Birch Stand: A large swath of birch trees makes up what was once a nature reserve walkway. Fox Earth Hill: A gently sloping hill which has been favoured by red fox families. Broken Bifrost: An old mill that is nearly ready to collapse into the small lake it has formed. Tuktu Lodge: A lodge with supplies for hunting, trapping, and leatherworking. Great River Crossing: A main crossing point for Krokarans to reach the westernmost territory. Hallow Crossing: An old concrete bridge crossing a swift river. The Murkwood: A floodplain forest filled with berries and herbs. Firelight Hollow: A dense forest area west of Fiskebyn, part of which is fenced in for the caribou. Black Lake: A larger cold lake shaded by trees. Echo Caves: A system of caverns located in Black Lake. Pack members can dive down to them and surface inside. Piren: Docks and storage on the shore of Black Lake. River of Fire: A slow moving river that reaches Black Lake. Sister Lake: A smaller lake south of Black Lake. Fiskebyn: The main village where Krokaran live. It is a mix of cottages and luperci-made houses. Aster's Fields: Grazing fields for livestock. Briar Patch: Farm fields that are being reclaimed by wilderness. The Swamp: A murky swamp just north of the Ail Po Farm, with water the color of tar. Knee High Village: A village of foot-tall houses in the Miramichi Wilderness. Miramichi River: A slow moving river with several branches. Beaver Dam Pond: A small offshoot of the Miramichi River has been dammed by beavers. Parlay House: A guest house located at the edge of the territory. Riverbend Orchards: Overgrown fruit tree orchards and a pumpkin patch. Stora Kvarnen: A sturdy wood and stone mill. Ail Po Farm: A dilapidated barn that is home to a feral cat colony. Artist's Alley: An old underpass that served as a former skatepark and graffiti graveyard. Elsipogtog Elementary School: A brick, single story school building. St. Anne's Church: A crumbling, old catholic church. Star-Tex: An old Texaco gas station and chop shop in one. Many car parts, tools, wheels, and miscellaneous paraphernalia can be found here. The Bunker: An old bunker built into a hill with a wooden door. Ranks were loosely based off the hierarchy of a ship, with five tiered paths focusing on Trade, Production, Foundation, Exploration, and Defense. Advancement occured through gaining co-ranks. -- Actively warring or recently warring or otherwise experiencing conflict. -- Poor relationship. It's pretty clear these guys don't like each other much. -- Good relationship, but no official alliance. Although tensions existed between individual members, Salsola and Krokar remained neutral to each other due to their mutual interest in trade. OOC ASSUMPTIONS: Little was known about Salsola. Krokarans were welcome to establish relations or organize trades with caution. A number of positive interactions took place with the Mistwalkers, most notably with both leaders from the two packs. Gifts were exchanged and Krokar was optimistic of future relations with Mistfell Vale. OOC ASSUMPTIONS: Krokarans could assume to have heard of Mistfell Vale and were encouraged to extend trade with its members. Krokar extended relations to the Court by Semini's initiative in the summer of 2015. Semini's contact, Mara, was the Court's diplomat and Baroness until she departed in early 2016. Milos and Courtier Thyri had the closest contact afterwards, though the Court's new Queen, Kalypso, had begun to bolster relations prior to Krokar's disbandment. OOC ASSUMPTIONS: Krokarans could assume to have heard of Cour des Miracles and were encouraged to trade with its members. Relations between Krokarans and Cavaliers was initiated by Sylvie and Lola of Casa and Milos. Their bond was since strengthened and maintained by efforts from the Lune's own daughter, Teagan. OOC ASSUMPTIONS: Krokarans could assume to have heard of Casa di Cavalieri and were encouraged to trade with its members. Positive relations were formed shortly after Krokar established itself in the Mainland territories, when August Cormier & Taseko visited New Dawn and met with Raeka Damaichu and Kiara Amarok -- New Dawn's Alpha and Omega respectively. Ties were further strengthened through trade agreements and Krokaran support during a mysterious illness and following the spring floods in 2015. Krokar was deeply affected and unnerved when the pack was attacked and forcibly disbanded. Lilith Fairbreeze visited New Dawn on long trade trip and was greeted by Altair Amarok. She was informed that her goods were a bit too humanized for the pack, but the interaction was positive and further strengthened pleasantries between the two packs. Relations with AniWaya started more slowly than those with their fellow Mainland neighbors, due primarily to the distance between the two packs. But once a bond was established, thanks to the quick friendship of Krokar's Eliza Cormier and AniWaya's Galilani Adahy, the two packs nurtured a friendly and mutually beneficial relationship. Talks of expanding the livestock breeding program previously developed with Vinátta to AniWaya were started but the tribe disbanded before plans could be put into play. October 2016: Krokar is gifted several animals following AniWaya's disbandment: 6 horses, 4 head of cattle, 8 sheep, 6 chickens, and 4 ducks. Overall, relations with Midnight Shores were pleasant, trade was encouraged, and discussions for a future meet-up between the two packs' leaders had even been arranged to discuss a potential alliance. Unfortunately, Midnight Shores' untimely disbandment in December 2016 has dissolved all future plans. There was no official alliance between the two packs, but their similar values made Krokarans and Vináttans compatible neighbors. An inter-pack livestock breeding program had been established and there was the potential for a future alliance between them. After Vinátta's disbandment in June 2017, many of its members went on to join Krokar. September 2014: Lucille and August, pay Florina Soul, the leader of VN, a visit. They share gifts and information with her and are invited inside the territory. July 2015: While visiting Krokar, Sylven Firebringer comes upon Captain August Cormier on his way to socialize with the caribou. what are you, friendly stagbeasts? August 2015: Curious about Vinátta's llamas, Milos visits the pack and discusses a potential trade with Aspen. After the devastating attack on New Dawn which resulted in disbandment, Krokar members were warned to be on their guard with any Anathema members and trade had been unofficially barred with the misfits. Since Krokarans had little to do with Anathema, its own disbandment at the beginning of March 2018 had no impact on Krokar. Krokar had been involved with Sapient since it was first established and was quick to forge an alliance with the pack, a decision that significantly benefited both packs on several occasions. Their alliance provided exclusive trade opportunities, protection during times of strife, and assistance during natural disasters. It was encouraged that Krokarans sought to strengthen bonds with Sapiens through diplomacy and trade. Sapient's untimely disbandment in the middle of July 2018 was a great loss to Krokar. October 2014: Sapient's founding member Akantha is the sister to Krokar member Semini. October 2015: Ciara and Miwa meet at Sapient's borders and exchange some information about their packs. Not much was known about the coyotes on the Peninsula, though Krokarans were encouraged to be vigilant of Infernians after Taseko was attacked by one of its members. As time went by and no further altercations occurred with the coyotes, Krokarans were welcome to establish relations or organize trades with caution, though few, if any, ever did. Since Krokarans had little to do with the clan, Inferni's disbandment at the start of August 2018 had no impact on Krokar.